Universally acclaimed when it was first published in 1968, Slouching Towards Bethlehem has become a modern classic. More than any other book of its time, this collection captures the mood of 1960s America, especially the center of its counterculture, California. These essays, keynoted by an extraordinary report on San Francisco's Haight-Ashbury, all reflect that, in one way or another, things are falling apart, "the center cannot hold." 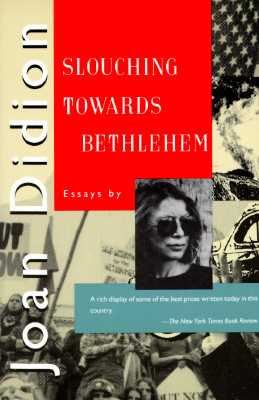 An incisive look at contemporary American life, Slouching Towards Bethlehem has been admired for several decades as a stylistic masterpiece.